Last summer, when I did a 4th-of-July-themed episode of my wildly unpopular internet-radio show, my buddy Dave asked if I’d play “In the USA” from Life in a Blender’s 1988 debut album. Now hold on a cotton-picking second: Sure, Dave’s a buddy, but A) we didn’t grow up together; he graduated college three years before me, and B) he lives all the way out in California, and C) he’s not allowed to know about Life in a Blender! That’s my dirty little secret! In the mid-’90s, my wonderful friend Sarah (for those making a flowchart, she graduated one year after me, and lives in Massachusetts) took me to a New York bar called McGovern’s, because she is a problem drinker. But also because her coworker Don’s band was playing there. And that band was Black 47. OK, no, it was Life in a Blender. I was immediately taken by their wit, off-kilter tunefulness, and overall joie de vivre except McGovern’s was the sort of place where if you said “joie de vivre” too loud you might get punched in the face. And Al Houghton was the guitarist and I’d seen his name on They Might Be Giants records so I quickly knew, ooh, these weren’t just some clowns in the back of a dingy bar, this was a real band! 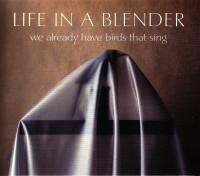 I have followed Life in a Blender, from a safe distance, ever since. There’s a song on their new release entitled “Frankenstein Cannot Be Stopped,” but it’s the band that is truly unstoppable. But hey, who cares how long the album is when everything you could possibly want is packed into the opening song, the would-be title track “Tongue-Cut Sparrow.” A blast of brass welcomes us, quickly followed by vocalist/lyricist Don Rauf sounding like Tom Waits’ kid brother. We also get call-and-response vocals, an angelic bridge, an old-timey megaphone, and those horns keep swinging. And what’s that, an organ fill? This is almost too musical! “Falmouth” has a much lighter, breezier feel. It’s as if the band took the same ingredients—horns, call-and-response, that trusty megaphone—and placed them in some sort of kitchen mixing appliance, creating something entirely new. Rauf croons much more innocently and Rebecca Weiner Tompkins’ lovely violin sits in the front seat for this summer trip to the Cape. All of a sudden, summer’s done and it’s midnight on Halloween. The aforementioned “Frankenstein…”, a fairly straightforward tale of watching the Frankenstein movie, is rendered spooky by Dave Moody’s moody cello, Ken Meyer’s martial drumming, and a tick-tock chiming guitar, before the band really stretches out in the song’s final minute. With its chicka-chicka rhythm guitar and bursts of horns, “Shards” starts out sounding like a cover of the Jackson 5’s “I Want You Back.” It soon mutates into Blender’s own brand of twisted funk, anchored by Mark Lerner’s bottomless bass. “Mamanama” may the catchiest thing here—a revved-up country/western stomper with an ear-worm nonsense-word chorus. It’s “Last Train to Clarksville” and the Muppets’ “Mahna Mahna” on amphetamines at the Grand Old Opry. Tompkins and Moody trick us into thinking “Good Answer” is going to be pretty, but Meyer’s pounding beat braces us for Rauf’s litany of political-and-pop-culture buzzwords. While he indicts modern society, a Greek game-show chorus shout-intones “Good answer!” Freedom from choice is what you want, as a wise man once said. Someday, now on the west coast, it’s feasible I think to have a glorious evening sailing into the sunset. On a darker not, it’s also related to an elaborate plan I concocted some years ago on how I would commit suicide. Hang on at least until the fall, there are some good records coming out. Took me a little while to warm to “Ohm” but I like the Ira-and-James lead vocal which was a different sound for them. The album after Electro-Pura, I Can Hear the Heart Beating As One, remains my fave — as with this LIAB album, it’s a showcase for different styles (in YLT’s case, feedback freakouts, garage rock, quieter melodic stuff, etc.). I remember “I can Hear the Heart” coming out. I really liked the cover art, and may have given it a spin at the listening station. pretty good from what I remember, but also one of those albums where you go into a hip record store and they have a display for what the Employee staff recommends (lot of Seattle did that, don’t really know about other places). I can hear The Heart was kind of quintessential to that, where I almost always avoid staff recommendations.